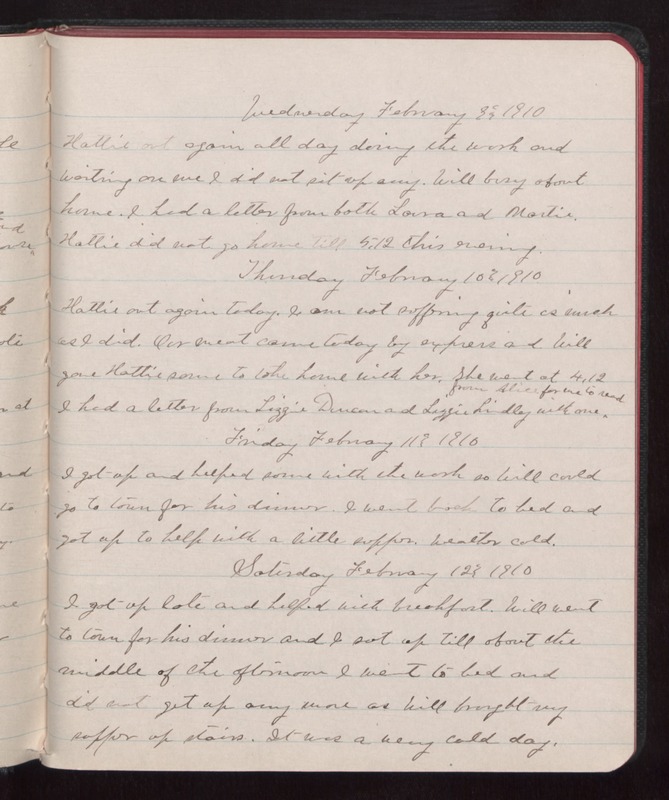 Wednesday February 9 1910 Hattie out again all day doing the work and waiting on me I did not sit up any. Will busy about home. I had a letter from both Lorna and Martin. Hattie did not go home till 5.12 this evening. Thursday February 10 1910 Hattie out again today. I am not suffering quite as much as I did. Our meat came today by express and Will gave Hattie some to take home with her. She went at 4.12 I had a letter from Lizzie Duncan and Lizzie Lindley with one from Alice for me to read Friday February 11 1910 I got up an helped some with the work so Will could go to town for his dinner. I went back to bed and got up to help with a little supper. Weather cold. Saturday February 12 1910 I got up late and helped with breakfast. Will went to town for his dinner and I got up till about the middle of the afternoon I went to bed and did not get up any more as Will brought my supper up stairs. It was a very cold day.